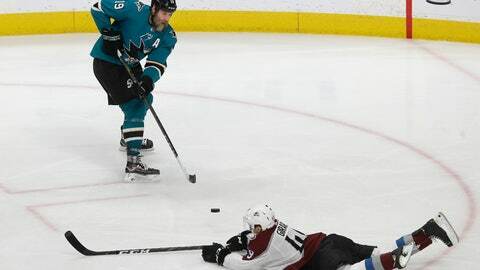 SAN JOSE, Calif. (AP) — Joe Thornton’s contributions to the San Jose Sharks in last year’s playoff series against Vegas were limited to pregame warmups and leadership. After being hampered by knee injuries the past two postseasons, Thornton is healthy to start the playoffs this year for the first time since leading the Sharks on a run to the Stanley Cup Final in 2016. San Jose opens the first round Wednesday night against the Golden Knights in a rematch of a second-round series won by Vegas in six games last year. Thornton missed the first two games of the 2017 playoffs before returning to play the final four of a first-round loss despite having a torn ACL in his left knee. He then missed the entire postseason with a torn ACL in his right knee last year. The 39-year-old Thornton enters the postseason playing his best hockey of the season, with his 33 points since Jan. 7 ranking third on the team in that span. Thornton’s play has given the Sharks three top centers, along with Logan Couture and Tomas Hertl, after being thin down the middle last year. While the top two lines get most of the attention from the opposition, Thornton has created consistent offense with wingers Kevin Labanc and Marcus Sorensen. A healthy Thornton isn’t going to be the only difference when these teams meet in the playoffs for a second straight year. The Sharks also added star defenseman Erik Karlsson in a trade before the season and another skilled forward at the trade deadline in Gustav Nyquist. The Golden Knights added an entirely new second line that is talented enough to be the top group on many teams. Vegas signed Paul Stastny as a free agent in July, acquired Max Pacioretty in a deal with Montreal in September and then got the big piece that sparked the season at the trade deadline with a deal for Mark Stone. KARLSSON’S HEALTH: Karlsson missed 17 games with his second groin injury of the season before returning with some rust for the regular-season finale. San Jose hopes he can shake that rust quickly and get the team back to the form it had in December and January before the first injury happened and the Sharks were playing as well as anyone. Coach Peter DeBoer called Karlsson a critical piece who helps on both ends of the ice. IN BLOOM: Perhaps the biggest difference in last year’s series was the play of Vegas goalie Marc-Andre Fleury, who had two shutouts and a .935 save percentage in the series. Fleury missed nearly three weeks late this season with a lower-body injury and allowed eight goals in two losses after returning. But he has shown the ability to carry a team in the playoffs in the past. PLAYOFF JONES: Sharks goalie Martin Jones heads into the postseason with the lowest save percentage of any starting goalie in the playoffs. But ever since arriving in San Jose before the 2015-16 season, Jones has been better in the playoffs than the regular season. His .926 career save percentage in the playoffs ranks sixth best in NHL history among goalies with at least 40 starts. He has allowed two or fewer goals in nearly two-thirds of his postseason starts. FOURTH-LINE GRINDERS: Both teams have plenty of skill up front but the Golden Knights can bring an element of physicality with the fourth line featuring Ryan Reaves and Williams Carrier. Reaves led the league with 305 hits, while Carrier ranked fourth with 277. The Sharks will answer with enforcer Micheal Haley on the fourth line to start the series but could switch to Joonas Donskoi later. Donskoi, who was on the top line last postseason, has no goals in his last 34 games.